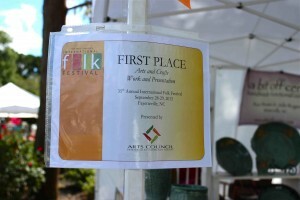 Home » Craft Show » First Place! This is show season. Although, we participate in shows throughout the year, the fall is our busy time. And, this year, we have a full docket. Our most recent show was in Fayetteville at the International Folk Festival where A Bit Off Center won first place for quality of work and display! It was really an exciting surprise that was accompanied by a certificate and a check.